Because of his early and violent death as well as the social changes he shepherded, if not championed, John F. Kennedy’s story has been told countless times and in various ways. This week’s new release LBJ seeks to turn the spotlight to the man who reluctantly joined him in the White House and who was thrust to the front office suddenly and unexpectedly upon Kennedy’s death. Directed by Rob Reiner, Woody Harrelson stars as the title character. The story follows him from the time of his own presidential aspirations to his decision to join Kennedy’s ticket in 1960, deciding he can do more within the system than railing against it. 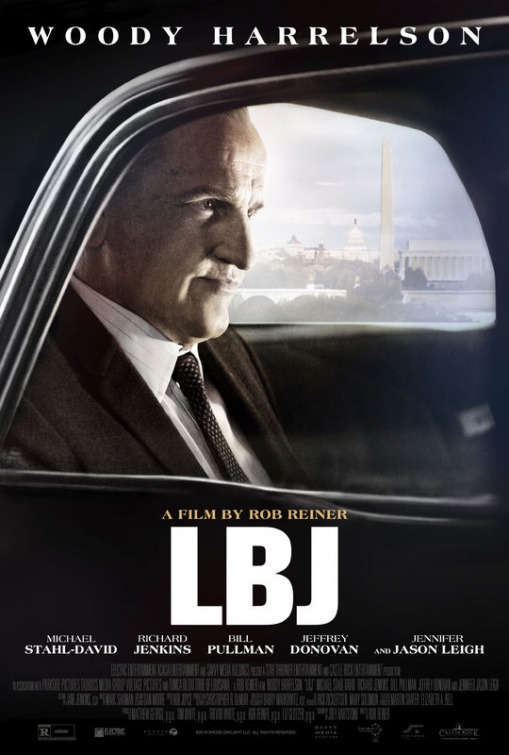 After Kennedy is killed, Johnson balances the reality of finally having his own hands on the wheel and the obligation he feels to finish the work Kennedy had begun, work he doesn’t always agree completely with. There’s not much going on with the first poster, which just shows Johnson in the backseat of a car that’s driving past various Washington landmarks. So we get the character and the setting, but there’s not much of a sense of style here. Reiner’s name appears above the title to help everyone’s awareness of his involvement. The trailer opens as the 1960 Democratic National Convention is gearing up for a showdown between Jack Kennedy and Lyndon Johnson for the party’s presidential nomination. Kennedy of course secures that nomination but then moves to bring Johnson on as VP, understanding the need to have a Southerner in the White House at this point in history. At first Johnson is conflicted and reluctant to advocate for Kennedy’s civil rights agenda, but as he says to someone else, if he’s involved then maybe he can slow things down a bit or lessen that impact. We see Kennedy’s eventual assassination and Johnson’s assumption of the presidency. It ends by making it clear Johnson will continue Kennedy’s work to preserve his legacy and the agenda the American people elected him to execute. There’s some solid drama happening here under the prosthetics worn by Harrelson. Reiner’s credentials as the director of similar stories The American President and A Few Good Men are of course offered here as an additional incentive for the audience. It looks like a standard biopic more or less, though I dig the focus on the civil rights agenda and how both men addressed that. This can’t be the only official website for the movie, right? It’s a single static image, the title superimposed over a photo of the president’s desk. There aren’t even links to the movie’s Facebook or Twitter profiles, which have been sharing marketing and publicity updates. Nothing I’m aware of, but it’s likely some online or social advertising has been done at the very least. The first big piece of publicity for the movie came in a first look at Harrelson as Johnson. The movie debuted at the 2016 Toronto International Film Festival. Around that time Reiner was the subject of a multi-part feature in The Hollywood Reporter, including this interview where he talked about the movie, his politics, his relationship with his father and much more. Shortly after that a long interview with Harrelson was published where he was supposed to be talking about playing the title role, which he did, but also opined at length about his opinions on government and presidents in general, neither of which are terribly positive. The movie screened at The New Yorker Festival, including a Q&A with Reiner where he not only talked about this project but also, as he had done on plenty of other occasions, about the current White House administration and more. Reiner did the radio and TV rounds to talk about how his opinions and perceptions of Johnson have changed after initial dislike, why he cast Harrelson in the title role, what it was like to return to political stories and more. It’s a shame to see a new Rob Reiner movie not getting the buzz it would have 20-odd years ago. But that’s where we are. The director has done everything in his power through all of his interviews and other press activities to tie Johnson’s story to modern day, showing he may have gone kicking-and-screaming into advocating for civil rights but that he got there. Harrelson has done likewise, with both of them sharing their thoughts on the current political climate and pointing out its parallels to the Johnson era. That hasn’t been enough to overcome what’s otherwise been a lackluster campaign. The trailer isn’t bad, but it’s also not fiery or distinctive enough to really make an impression. It seems more like a Baby Boomer trying to exorcise his own demons and relive a relatively unexplored moment of their own youth on film. There’s just too much other competition out there for this to break out, a problem not helped by the relatively lackluster efforts on display here.